FKLI March futures contract close 4.5 point higher to close at 860.5 as compare to previous trading session with total 4067 lots traded in the market. FKLI surge up during trading session possible due to KLSE was holding well despite regional indices and Dow Jones futures electronic trading were traded downwards. 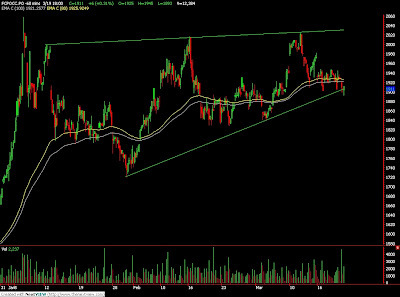 Technically, FKLI seems break up after long consolidation within 850 to 855 price range. We expect FKLI would trade lower in the coming trading session provided resistance levels at 866 and 874 regions were not violated. 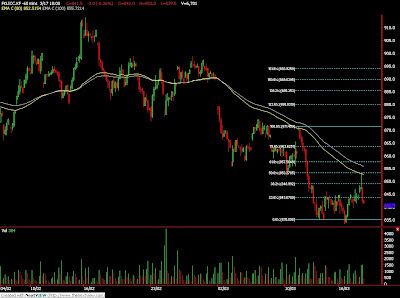 Traders were advice to continue to hold short position in the coming trading session while extra alert around support levels at 849 and 835 regions. FCPO 3rd month June Futures contract surge RM74 higher to close at RM1985 as compare to previous trading session with 14813 lots traded in the market. CPO price was trader higher through the entire trading session as crude oil and soybean starts electronic surge up due to news release regarding about the increment of export tax. Technically, CPO price surge up fiercely after manage to break from the minor falling wedge in the hourly chart Fibonacci support seen at RM1910 regions. We expect there would be mild retracement for CPO price trading after completed 61.8% Fibonacci projection at RM1985 levels. 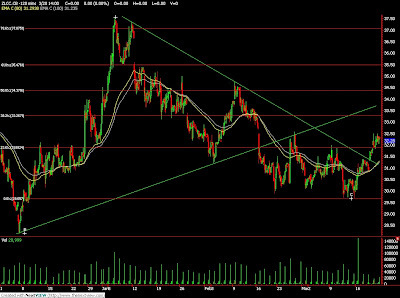 Traders were advice to hold long position around support levels at RM1940 and RM1927 regions. 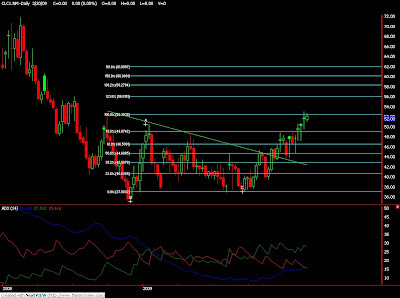 Resistances were seen at RM1990 and RM2040 levels. March 20 (Bloomberg) -- Crude oil fell from a three-month high as the dollar climbed against the euro, decreasing the appeal of commodities as an alternative investment. Oil dropped as the dollar advanced from the weakest level in two months versus the euro. Commodities surged and the U.S. currency plunged earlier this week after the Federal Reserve said it will buy bonds to revive the economy. A government report showed that oil supplies rose last week as demand fell. Crude oil for April delivery fell 55 cents, or 1.1 percent, to settle at $51.06 a barrel at 2:56 p.m. on the New York Mercantile Exchange. Oil touched $52.25 yesterday, the highest since Dec. 1. Prices rose 10 percent this week and are up 14 percent this year. The April contract expired today. The more-active May futures contract rose 3 cents to $52.07 a barrel. The dollar rose as some traders bet the slump this week, stoked by the Federal Reserve’s plan to start buying Treasuries, was overdone given the outlook for the U.S. economy. The U.S. Dollar Index in New York, which tracks the currency against six others, was up 0.9 percent to 83.841 at 3:09 p.m. in New York, its first increase in nine days. The index trades on ICE Futures in New York. The dollar rose 0.8 percent to $1.3552 per euro from $1.3665 yesterday. U.S. crude oil supplies rose 1.94 million barrels to 353.3 million barrels last week, an Energy Department report on March 18 showed. Stockpiles of gasoline and distillate fuel, a category that includes heating oil and diesel, also increased, the department’s report showed. Fuel consumption dropped 0.6 percent last week to 18.8 million barrels a day, the lowest since the week ended Jan. 9, according to the department. Total daily fuel demand averaged over the past four weeks was 19.1 million barrels, down 3.2 percent from a year earlier. Oil prices have increased for five consecutive weeks, the longest streak of increases in 11 months. The Organization of Petroleum Exporting Countries deferred another production cut for at least 11 weeks at its March 15 meeting in Vienna. OPEC is scheduled to meet again on May 28. OPEC has reduced daily output targets by 4.2 million barrels since September to prevent a supply glut. Members need to trim about 800,000 barrels a day to comply with the quotas that went into effect in January. Brent crude oil for May settlement rose 55 cents, or 1.1 percent, to end the session at $51.22 a barrel on London’s ICE Futures Europe exchange. Merrill Lynch & Co. raised its forecast for 2009 Brent oil by $2 a barrel to $52 because of reduced supply from OPEC members and other producers, including Russia, Norway and Azerbaijan. Prices will also be supported by demand in emerging markets, analyst Francisco Blanch said in a report today. Seventeen of 33 analysts surveyed by Bloomberg News, or 52 percent, said futures will fall in the week ending March 27. Twelve respondents, or 36 percent, forecast oil prices will increase and four said that there will be little change. Crude oil volume in electronic trading on the Nymex was 308,129 contracts as of 3:11 p.m. in New York. The market today headed for the lowest volume since Jan. 2. Volume totaled 565,401 contracts yesterday, 4.7 percent higher than the average over the past three months. Open interest yesterday was 1.15 million contracts. The exchange has a one-business-day delay in reporting open interest and full volume data. KUALA LUMPUR, March 20 (Reuters) - India, a top vegetable oil importer, may see prices of imported soyoil keep their premium over rival palm oil due to increased demand after a cut in soyoil import duties, a leading analyst said on Thursday. Dorab Mistry, head of vegetable oil purchasing with Indian conglomerate Godrej International, said the world's second-largest consumer of vegetable oil after China may import up to 1.5 million tonnes of soyoil from Nov 2008 till Oct 2009. Soyoil imports were originally estimated by traders to be about 1.4 million tonnes for the period. Palm oil imports from Malaysia and Indonesia, are expected to fall to 5.3 million tonnes from the 5.66 million tonnes forecast last week, Mistry said. Sunflower imports would jump to half a million tonnes, just 16.6 percent short of trader estimates. Mistry said he expects crude palm oil futures to fall to 1,500 ringgit and RBD palm olein to slip towards $500 on a free on board basis. "On the other hand, I now expect soyoil to maintain a premium over palm. Soyoil is likely to fall to $550 free on board Argentina," Mistry said in an emailed statement. Traders said import tax on crude soyoil, currently at 20 percent, may be totally withdrawn as with crude palm oil and sunoil. The Indian government is keen to ensure steady supplies and moderate prices ahead of general elections scheduled to be held in April and May, which analysts say was a key factor in cutting the import tax. Indian traders said landed cost for palm oil was $595 per tonne, a discount of 17.9 percent to soyoil at $725 per tonne on account of palm oil's duty free status for the past one year. Mistry revised his estimate for India's vegetable oil imports for the oil marketing year which started in Nov last year up 4.2 percent to 7.5 million tonnes from his previous estimate last week at the Bursa Malaysia Palm Oil Conference. Elsewhere in Europe, the scenario is different with palm oil trading at 6.9 percent premium to soyoil priced at $547 per tonne. "Additional Indian demand of 300,000 tonnes will not make any difference to my price projection because worldwide supply comfortably exceeds demand this year," he said. "Recent estimates of a big increase in plantings of soy in United States and of canola in Canada will cancel out any rise in Indian demand." India imports more than half of the 11 million tonnes of vegetable oils it consumes annually. Palm oil makes up 80 percent of the country's vegetable oil imports and soyoil the remainder. India buys refined palm oil from Malaysia and crude palm oil from Indonesia as well as soyoil from Brazil and Argentina. March 19 (Bloomberg) -- Gold jumped the most in six months in New York after the Federal Reserve’s plan to buy debt weakened the dollar and revived concerns inflation will accelerate. Silver surged to the biggest gain in 29 years. The dollar fell as much as 2.3 percent against a weighted basket of six major currencies. The greenback dropped 2.7 percent yesterday following the Fed’s pledge to buy as much as $1.15 trillion of Treasuries and mortgage debt to cut borrowing costs. Gold reached a record $1,033.90 an ounce on March 17, 2008, as interest-rate cuts sent the dollar to an all-time low against the euro. The metal is up 8.4 percent this year. Gold futures for April delivery soared $69.70, or 7.8 percent, to $958.80 an ounce on the New York Mercantile Exchange’s Comex division, the biggest gain for a most-active contract since Sept. 17. Silver futures for May delivery rose $1.585, or 13 percent, to $13.52 an ounce on the Comex, the highest jump for a most- active contract since Dec. 31, 1979. The metal has risen 20 percent this year. The central bank pledged to buy as much as $300 billion of Treasuries, as well as to expand purchases of mortgage-backed securities by $750 billion and of debt from government-sponsored enterprises by $100 billion, to ease credit and boost the housing market. On Feb. 23, UBS said gold could reach $1,050 an ounce within a month. The Fed yesterday also left its benchmark lending-rate target range at zero to 0.25 percent and said it may keep it there for an “extended” time. “With the interest-rate tool out the window, the Fed is cranking up the printing press,” LaSalle’s Zeman said. Central banks are lowering borrowing costs and spending trillions of dollars in response to the worst financial crisis since the Great Depression. That may devalue currencies and boost demand for bullion as an alternative investment. For most of this year, gold and the dollar have abandoned their traditional inverse relationship as investors bought both assets to hedge against turmoil in financial markets. The correlation may resume after the Fed’s announcement, analysts said. Assets in the SPDR Gold Trust, the biggest ETF backed by bullion, expanded 1.4 percent to a record 1,084.33 metric tons yesterday, according to the company’s Web site. ETF Securities Ltd.’s exchange-traded products backed by bullion attracted almost $134 million last week, the company said today. Gold’s rally after the Fed’s announcement is “insane” because U.S. inflation may not accelerate until 2011, said Peter Fertig, owner of Quantitative Commodity Research Ltd.
March 20 (Bloomberg) -- Crude oil is poised to gain for a fifth week, the longest winning streak in 11 months, after rising above $50 a barrel on the Federal Reserve’s plans to spur growth by spending $1 trillion buying back debt. Oil climbed 7.2 percent yesterday to close at a three month high after the Fed said it was seeking to purchase U.S. Treasuries, mortgage-backed bonds and other de19bt, raising expectations that efforts to end the global recession will boost fuel demand. The dollar traded at a two-month low against the euro, prompting investors to purchase oil and other commodities as an alternative investment. Crude oil for April delivery fell 76 cents to $50.85 a barrel on the New York Mercantile Exchange at 10:06 a.m. in Sydney. Oil is up 10 percent this week, set for its longest series of weekly gains since April 2008. Yesterday, futures rose $3.47 to $51.61 a barrel, the highest settlement since Nov. 28. The April contract expires today. The more-active May contract decreased 62 cents to $51.42 a barrel after advancing $3.14 to $52.04 a barrel yesterday. Oil has risen 50 percent in the past three months from the Dec. 19 close of $33.87 a barrel. Crude has gained 14 percent so far this year as record production cuts by the Organization of Petroleum Exporting Countries have started to reduce a supply glut caused by the worst economic crisis since World War II. Prices are down 65 percent from July’s record of $147.27 a barrel. The trade-weighted Dollar Index, which tracks the currency’s performance against the euro, yen, pound, Canadian dollar, Swiss franc and Swedish krona, slid yesterday for an eighth day, the longest stretch in a year. The dollar was down 1.4 percent to $1.3667 per euro from $1.3474 March 18. Gold yesterday jumped the most since September and copper surged to the highest since November on the Fed announcement. The Reuters/Jefferies CRB Index of 19 prices rose 11.36, or 5.3 percent, to 225.30, the highest since Jan. 26. The decline in the value of the U.S. currency, which helped push oil to the July record, will not “be on the agenda” at OPEC’s next meeting, the group’s president, Jose Maria Botelho de Vasconcelos, said. The May 28 meeting will focus instead on how the oil market is reacting to OPEC’s March 15 decision to hold targets steady and concentrate on complying with earlier cuts, he said in an interview in Vienna yesterday. Botelho de Vasconcelos is also the oil minister for Angola. OPEC members “have been rewarded now with a higher price,” Daniel Yergin, chairman of Cambridge Energy Research Associates, said in a Bloomberg Radio interview. The producer group will reduce crude-oil shipments by 3.3 percent in the month ending April 4, according to Oil Movements. Members will load 22.41 million barrels a day in the period, down from 23.18 million a day in the month ended March 7, the Halifax, England-based tanker tracker said in a report yesterday. Government efforts to revive global economies will have a bigger impact on oil prices than OPEC policy as demand declines by 1.8 million barrels a day this year, Yergin said. “There’s still definitely a lid on prices for at least several months,” Yergin said. Brent crude oil for May settlement rose $3.01, or 6.3 percent, to $50.67 a barrel on London’s ICE Futures Europe exchange. Futures settled at the highest since Nov. 28. FKLI March futures contract close 2 point higher to close at 856 as compare to previous trading session with total 5175 lots traded in the market. FKLI was traded without main direction as contradicting world indices with Dow Jones futures electronic trading. Technically, FKLI seems manage to rebound 61.8% Fibonacci retrace figure at 857.5 regions and complete a diagonal formation as manage to break down from short term support levels at 854 regions. 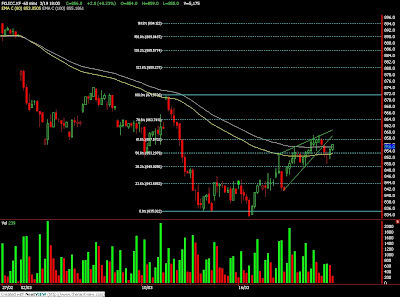 We still FKLI expect still riding on bear trend with resistance seen at 864 and 874 levels. Traders were advice to continue hold short position in the coming trading session while be alert of support levels at 849 and 835 regions. FCPO 3rd month May Futures contract rise marginally RM6 higher to close at RM1911 as compare to previous trading session with 12384 lots traded in the market. CPO price was surprisingly traded lower during the trading session despite announcement of increment of Export tax by Argentina being release during the trading session. Technically, CPO price seems attempt to breach the support levels at 1900 region during the last trading session. 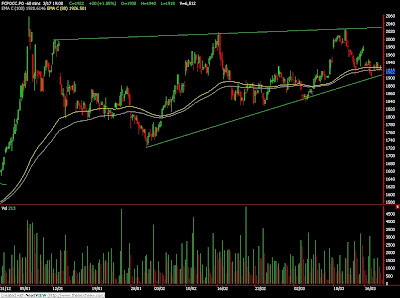 We seen CPO price attempt to break down from the rising wedge in the hourly price chart. Traders were advice to trade CPO cautiously and wait for confirmation for CPO price to break down from the rising wedge formation. 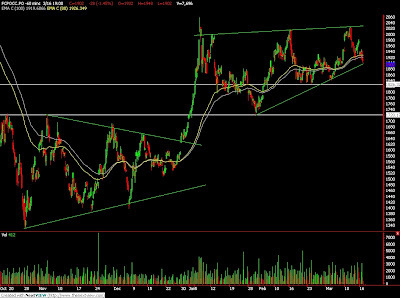 Support levels were seen at RM1900 and RM1870 region while resistance seen at RM1950 and RM1982 regions. March 19 (Bloomberg) -- India, the world’s biggest buyer of vegetable oils after China, scrapped a 20 percent tax on imports of crude soybean oil to the bring duties on the commodity on par with palm oil, its main substitute. Trade Secretary G.K. Pillai made the announcement in New Delhi today. The duty was first imposed in November to shield oilseed growers from purchases made at zero duty. No duty was levied on crude palm oil, making its purchases more attractive. Ending the duty may boost India’s purchases from Argentina and Brazil, the biggest suppliers, helping stem a 44 percent drop in soybean oil prices in Chicago. Duty-free purchases of soybean oil may also reduce India’s dependence on imports of palm oil from Malaysia and Indonesia. “Duty abolition will pave the way for a further influx of cheaper edible oils,” and lower palm oil purchases, Davish Jain, chairman of the Central Organisation for Oil Industry, said by phone from Indore in central India. Palm oil futures for June delivery were little changed at 1,906 ringgit ($521) a ton in Kuala Lumpur after rising as much as 2.1 percent earlier to 1,945 ringgit. Soybean oil for May delivery climbed as much as 2.9 percent to 31.80 cents a pound in after-hours trading on the Chicago Board of Trade. Vegetable-oil imports by the South Asian country surged 68 percent to 2.95 million tons in the four months ended February from a year earlier, the Solvent Extractors’ Association of India said this week. Soybean oil imports totaled 281,349 tons in the period, up from 172,884 tons a year ago, while palm oil imports were 2.33 million tons, 83 percent of the total, the group said. The country depends on imports to meet almost half its edible-oil demand. Still, scrapping the import tax on soybean wasn’t necessary as prices of the commodity have declined amid the global recession, Jain said. “I fail to see any logic behind this proposal as edible oil prices are down and India’s economy is close to a deflationary situation,” he said. India’s inflation slowed to a two-decade low of 0.44 percent in the week to March 7 from a 16-year high in August. Duty-free imports may hurt farmers who have begun harvesting a bumper canola crop, said B.V. Mehta, executive director at the extractors’ group. NEW DELHI, March 19 (Reuters) - India has cut import duty on soyoil to keep domestic prices stable, Trade Secretary G.K. Pillai told reporters on Thursday. Pillai did not give details but traders said import tax on crude soyoil, currently at 20 percent, may be totally withdrawn like on crude palm oil that is imported duty free. Details of the cut in import duty would be available after the government issues a formal statement. India had scrapped import duties on crude edible oils a year ago when domestic prices were surging, but it again levied a 20 percent tax on crude soyoil in November, which led to a higher palm oil imports. "If import duty on soyoil is withdrawn, it will bring all crude oil imports on an equal footing," said Sandeep Bajoria, chief executive of Mumbai-based trading firm Sunvin Group. He said this would increase soyoil imports, hurting domestic rapeseed growers as local prices would fall. The government is keen to ensure steady supplies and moderate prices ahead of general elections scheduled to be held in April and May, which analysts say was a key factor in cutting the import tax. March 19 (Bloomberg) -- India, the world’s second-biggest buyer of vegetable oils, may import more soybean oil from South America if a 20 percent import duty is removed, the head of a processors’ group said, amid speculation the tariff may end. Purchases from Argentina and Brazil may be increased and supplies of palm oil from Malaysia and Indonesia may be cut, Davish Jain, chairman of the Central Organisation for Oil Industry, said today. The finance ministry will shortly issue a notification scrapping the duty, the Economic Times reported today, citing an unidentified government official. Ministry spokesman B.S. Chauhan couldn’t immediately comment. While India imposed the import duty on crude soybean oil in November to shield local farmers, no duty was levied on crude palm oil, boosting imports. Increased Indian purchases may help stem a 44 percent decline in soybean oil prices in Chicago and pressure Malaysian palm oil prices that rose 14 percent this year on surging sales to India and China. India relies on imports to meet almost half its edible-oil demand. Inflation eased from 12.91 percent in August to a six- year low of 2.43 percent in the week to Feb. 28. The South Asian nation boosted vegetable oil imports 68 percent to 2.95 million tons in the four months ended February from a year earlier, the Solvent Extractors’ Association of India said this week. Palm oil imports made up 2.33 million tons, or 83 percent of the total, the group said. Soybean oil imports totaled 281,349 tons between November and February, compared with 172,884 tons a year earlier, according to the processors’ group. Palm oil for June delivery advanced as much as 2.1 percent to 1,945 ringgit ($532) a ton in Kuala Lumpur today. Soybean oil for May delivery climbed as much as 2.7 percent to 31.74 cents a pound in after-hours electronic trading. MUMBAI, March 19 (Reuters) - India soybean, soyoil, and rapeseed futures may rise on Thursday morning tracking firm crude oil prices, overnight gains on Chicago Board of Trade and Malaysian palm oil, analysts said. Firm U.S. crude oil prices CLc1 lifted demand for soyoil and oilseeds demand from the biofuel sector. The April soybean NSBJ9 on the National Commodity and Derivatives Exchange ended down 0.53 percent at 2,330 rupees per 100 kg on Wednesday. The April soyoil futures NSOJ9 ended down 0.79 percent at 453.75 rupees per 10 kg. At 9:01 a.m., benchmark June palm oil KPOc3 on the Bursa Malaysia Derivatives Exchange was up 1.21 percent at 1,928 ringgit a tonne. March 19 (Bloomberg) -- Crude oil rebounded after the U.S. Federal Reserve unexpectedly announced debt purchases aimed at lowering consumer borrowing costs and ending the recession, prompting gains in equities and a drop in the dollar. The Fed plans to buy as much as $300 billion of Treasuries, as much as $750 billion of bonds backed by government-controlled mortgage companies and $100 billion in debt from other government agencies to loosen credit and boost home sales. Crude oil for April delivery rose $1.28, or 2.7 percent, to $49.42 a barrel on the New York Mercantile Exchange at 10:41 a.m. Sydney time. Yesterday, futures fell $1.02, or 2.1 percent, to settle at $48.14 a barrel. Prices are up 7.9 percent this year. The Standard & Poor’s 500 Index added 2.1 percent, extending its rally since last week’s 12-year low to 17 percent. Yields on 10-year notes dropped the most since at least January 1962. The dollar sank the most against the euro since September 2000. Oil prices settled lower yesterday after a government report showed that U.S. supplies of crude oil, gasoline and distillate fuel, a category that includes heating oil and diesel, rose last week in the U.S., the world’s largest energy consuming nation. Crude stockpiles climbed 1.94 million barrels to 353.3 million last week, the Energy Department said yesterday. Inventories were forecast to rise by 1.5 million barrels, according to the median of analyst estimates in a Bloomberg News survey. Supplies of gasoline and distillate fuel, a category that includes heating oil and diesel, also increased. Stockpiles at Cushing, Oklahoma, where New York-traded West Texas Intermediate crude oil is delivered, increased 368,000 barrels to 33.9 million barrels last week, the Energy Department said. Supplies in the week ended Feb. 6 were the highest since at least April 2004, when the department began reporting on inventories at the location. U.S. refineries operated at 82.1 percent of capacity, down 0.6 percentage point from the prior week, the report showed. Gasoline inventories rose 3.19 million barrels to 215.7 million barrels, the department said. It was the biggest gain in two months. Stockpiles were forecast to fall by 1.5 million barrels, according to the median of responses by 15 analysts in the Bloomberg News survey. Distillate fuel supplies rose 112,000 barrels to 145.5 million, the department said. A 1 million-barrel increase was forecast. Fuel consumption dropped 0.6 percent last week to 18.8 million barrels a day, the lowest since the week ended Jan. 9. Total daily fuel demand averaged over the past four weeks was 19.1 million barrels, down 3.2 percent from a year earlier. Crude oil in New York has tumbled from a record $147.27 in July as the U.S., Europe and Japan face their first simultaneous recessions since World War II, curbing demand for fuel. The global economy will shrink in the “neighborhood” of 0.6 percent this year, according to the International Monetary Fund’s second-ranking official. The IMF predicted in January the global economy would shrink 0.5 percent this year and any contraction would be the first since World War II. Organization of Petroleum Exporting Countries and IMF officials said at a conference yesterday that lower oil prices are cutting investment in new fields, risking a supply crunch when the economy recovers. “Today’s low prices could be setting the stage for another price run-up in the future,” Lipsky said yesterday at the OPEC- sponsored Vienna seminar. While current prices help recovery, they undermine projects to bring on stream new oilfields and produce fuel from tar-sands, he said. Brent crude oil for May settlement fell 58 cents, or 1.2 percent, to $47.66 a barrel on London’s ICE Futures Europe exchange yesterday. March 18 (Bloomberg) -- Soybeans rose for a third day on speculation that demand for the U.S. crop will improve as Argentine farmers withhold supplies over export taxes. Groups representing growers in Argentina will lobby Congress to cut grain levies after negotiations with the government yesterday failed to resolve issues that led to strikes in 2008. Eduardo Buzzi, a farm leader, called on growers to demonstrate along the nation’s highways. Last year’s protests disrupted exports and led to domestic food shortages. Soybean futures for May delivery rose 2 cents, or 0.2 percent, to $9.15 a bushel on the Chicago Board of Trade, after yesterday reaching a one-month high of $9.2175. The most-active contract still is down 44 percent from a record $16.3675 reached in July. Argentina is the world’s third-largest soybean exporter, after the U.S. and Brazil, U.S. Department of Agriculture data show. The South American nation is the biggest shipper of animal feed and vegetable oil made from the oilseed. Argentina’s government doesn’t plan to change tariffs on farm exports, Ricardo Echegaray, the country’s tax agency director, said today in an interview in Buenos Aires. The soybean tax may be reduced to 27 percent from 35 percent for growers who produce less than 1,000 metric tons a year, the Buenos Aires newspaper Clarin reported yesterday, citing sources it didn’t name. Farmers have halted sales to push President Cristina Fernandez de Kirchner’s government to cut export taxes and ease trade restrictions. Former president Nestor Kirchner, who was succeeded by his wife, asked farmers to drop their dispute with the government in a speech yesterday in La Plata. Soybeans are the second-biggest U.S. crop, valued in 2008 at a record $27.4 billion, behind corn at $47.4 billion, government figures show. FKLI March futures contract surge 12.5 point higher to close at 854 as compare to previous trading session with total 8166 lots traded in the market. FKLI was traded high during the trading session mainly due to strong KLSE indices performance closed at 847.96, up 6.09 points. 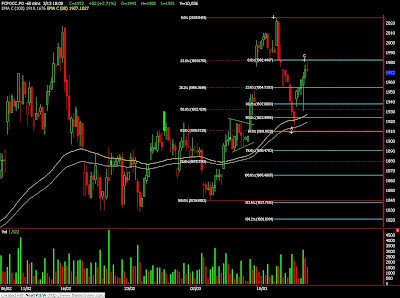 Technically, FKLI seems challenge the resistance levels at 853; 50% Fibonacci retrace figure. We expect FKLI would trade lower in the coming trading session provided resistance levels at 853 and 874 were not violated. Traders were advice to hold short position as downtrend was seen as our primary trend. Support levels remain at 850 and 835 regions. FCPO 3rd month May Futures contract fall RM17 lower to close at RM1905 as compare to previous trading session with 5753 lots traded in the market. CPO price was mainly trading sideways throughout the entire trading session. 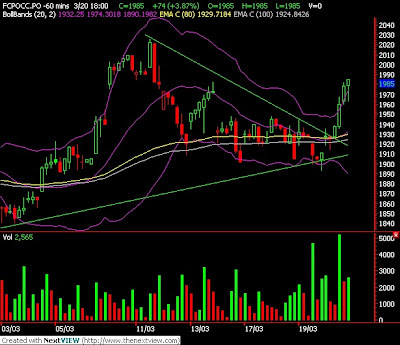 Technically, CPO seems break down from a trend line in the 15 minute price chart but close above hourly price chart. Confirmation breaks down from rising wedge in the hourly chart once support levels at RM1900 and RM1870 region were violated. Traders were advice to hold short position once the support levels were violated while put tight stop loss around resistance level at RM1950 and RM1980 regions. KUALA LUMPUR, March 18 (Reuters) - Malaysian crude palm oil futures edged higher on Wednesday as some buying interest spilled over from rival soyoil markets in the United States and China, along with prospects for better exports, traders said. * "The market is quiet except for some buying on the account of soyoil prices going up," said a trader with a foreign commodities broker. "Exports will be good for March but it could slow a little for the second half." * The benchmark June contract KPOc3 on the Bursa Malaysia Derivatives Exchange inched up 0.7 percent to 1,936 ringgit ($527.2) per tonne by midday. * Other traded months were marginally higher <0#KPO:>. Overall volumes stood at 6,012 lots of 25 tonnes each. * Malaysian traders said India's move was a formality and would have no impact in global vegetable oil markets as India exports very little but imports the most after China. * U.S. corn futures fell 0.3 percent and soy prices rose 0.3 percent on Wednesday as the U.S. acreage bidding war between the two crops heated up and investors corrected the corn/soy spread following corn's big gain on soy last week. * U.S soyoil delivery for May BOK9 fell 0.5 percent after rallying in the previous session while the most-active May soybean oil contract DBYK9 on China's Dalian Exchange was firm. March 18 (Bloomberg) -- Crude oil dropped from a three- month high after a U.S. government report yesterday showed inventories posted a larger-than-expected gain last week and refiners processed less fuel. Oil stockpiles increased 4.66 million barrels to 349.9 million barrels, the Washington-based American Petroleum Institute said in a report released after the close of trading yesterday. That’s the highest since the week ended June 29, 2007. Refineries operated at 82.3 percent of capacity, down 1.4 percentage points from the week before, API said. Crude oil for April delivery fell 48 cents, or 1 percent, to $48.68 a barrel on the New York Mercantile Exchange at 9:59 a.m. in Sydney. Yesterday, April futures rose $1.81, or 3.8 percent, to $49.16 a barrel, the highest settlement since Dec. 1. Prices have increased 10 percent so far this year. “The API crude number is bearish, but with a question mark or two behind it,” Evans said. Futures rose yesterday on optimism about the U.S. economy after a report showed that housing starts in the world’s biggest energy-consuming country surged in February. The Commerce Department report showed that work began on 583,000 homes at an annual rate, a 22 percent increase from January. Oil prices have plunged from a record $147.27 in July as the U.S., Europe and Japan face recessions. Gasoline and heating-oil futures prices surged, with the motor fuel reaching the highest in four months. The unexpected gain in housing starts and speculation about Fed policy also pushed U.S. equities higher. The Standard & Poor’s 500 Index climbed 3.2 percent to 778.12 yesterday. The Dow Jones Industrial Average rose 2.5 percent to 7,395.78. “The Dow is being looked at as a strong indicator of where the economy is going, making it a primary driver of the oil market,” said Rick Mueller, a director of oil markets at Energy Security Analysis Inc. in Wakefield, Massachusetts. Algerian Oil Minister Chakib Khelil said OPEC’s compliance with quotas will improve to about 95 percent by the time the group meets in May. The Organization of Petroleum Exporting Countries may still “take strong” measures to protect revenue should prices keep falling, Khelil, who held the group’s rotating presidency in 2008, said at a press briefing in Vienna. OPEC agreed to hold output targets steady at its meeting in Vienna on March 15 on concern higher prices could harm an ailing global economy. Ministers pledged to tighten compliance with record cutbacks agreed on last year after crude oil fell more than $100 from July’s record. “Even though OPEC didn’t enact a new cut, there’s no question that a substantial amount has already been taken off the market,” Mueller said. Oil also rose because April options expire at the close of trading in New York today. April $50 calls, which represent the right to buy oil at that price, were the most-actively traded options contracts on the Nymex yesterday. An Energy Department report today is forecast to show that U.S. crude oil inventories rose 1.5 million barrels last week, according to the median of 14 analyst estimates in a Bloomberg News survey. The department is scheduled to release its weekly report today at 10:30 a.m. in Washington. Gasoline stockpiles probably dropped 1.5 million barrels from 212.5 million the prior week, according to the survey. Supplies of distillate fuel, a category that includes heating oil and diesel, probably rose 1 million barrels from 145.4 million, the survey showed. Brent crude oil for May settlement increased $1.78, or 3.8 percent, to $48.24 a barrel on London’s ICE Futures Europe exchange yesterday. March 18 (Bloomberg) -- The yen fell to the lowest level against the euro this year on speculation central banks will unveil measures to combat the global recession, encouraging Japanese investors to buy higher-yielding assets overseas. Japan’s currency weakened for a seventh day against the New Zealand dollar, the longest losing streak in 11 months, on prospects the Bank of Japan will step up purchases of government bonds, further eroding the allure of the nation’s securities by holding down yields. The euro may rise for a seventh day against the dollar after an unexpected jump in U.S. housing starts triggered a stocks rally, boosting demand for riskier currencies. The yen fell to 128.73 against the euro at 8:05 a.m. in Tokyo, from 128.35 yesterday, when it slid 0.8 percent. Japan’s currency traded at 52.47 against the New Zealand dollar from 52.31 yesterday and was at 65.44 per Australian dollar from 65.26. The euro was at $1.3032, following a 0.4 percent gain yesterday. It touched $1.3072 on March 16, the strongest level since Feb. 10. The yen was at 98.78 per dollar. FCPO 3rd month May Futures contract rise RM20 higher to close at RM1922 as compare to previous trading session with 6512 lots traded in the market. CPO was traded sideways despite crude oil plunge during the trading hours. Technically, CPO price seem traded sideways throughout the trading session but still maintain within the rising wedge range. We expect CPO price would plunge during coming trading session provided support levels at RM1902 and 1880 were violated. Traders were advice to stay out for clear signal in order minimize unnecessary trading risk. Resistance were seen at RM1980 and RM2040 region. FKLI March futures contract close marginally 3 point lower to close at 841.5 as compare to previous trading session with total 6701 lots traded in the market. FKLI was traded wide trading range due to regional indices and Dow Jones futures huge volatility. 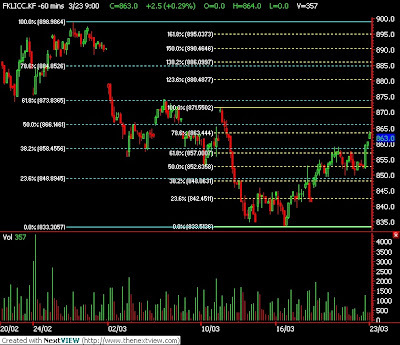 Technically, FKLI rebound 50% Fibonacci retrace figure at 853 regions after form some base around 840 regions. We expect FKLI would trade lower in the coming trading session provided resistance levels at 852 and 871 levels were not violated. Traders were advice to hold short position in the coming trading session while be extra cautious around support levels at 830 and 803 regions. March 16 (Bloomberg) -- Gold fell as an equity rally worldwide reduced the appeal of the precious metal as an alternative investment. Silver also declined. Equity indexes climbed in Asia and Europe, and U.S. stocks headed higher after posting the biggest weekly gain since November. Investment in the SPDR Gold Trust, the biggest exchange-traded fund backed by bullion, rose 2.7 percent last week to a record 1,056.8 metric tons. Gold futures for April delivery fell $8.10, or 0.9 percent, to $922 an ounce on the New York Mercantile Exchange’s Comex division. The metal still has gained 4.3 percent this year. Silver futures for May delivery dropped 32.5 cents, or 2.5 percent, to $12.89 an ounce on Comex. The metal is still up 14 percent this year. Demand for haven assets such as gold and U.S. Treasury debt may ease as equity markets stabilize and the economy improves, some analysts said. Last year, when the Standard & Poor’s 500 Index of U.S. equities fell 38 percent, Treasuries returned 14 percent and gold prices increased 5.5 percent. Treasuries were down 2.8 percent this year through March 13, according to Merrill Lynch & Co. bond indexes. Still, some investors may prefer gold to currencies after the Swiss National Bank said last week it was selling the franc and Wen Jiabao, the premier of China, said he is “worried” about his country’s investment in U.S. debt. China held $739.6 billion in treasuries as of Jan. 31, Bloomberg data show. The SPDR Gold Trust’s holdings of the metal have grown 35 percent this year. March 17 (Bloomberg) -- Crude oil fell in New York, retreating from yesterday’s two-month closing high, as U.S. stocks dropped for the first time in five days as concern over rising credit-card defaults ended a rally in financial companies. The Dow Jones Industrial Average and Standard & Poor’s 500 Index slipped after American Express Co. reported higher delinquency rates. Oil and equities had rallied earlier after the Group of 20 vowed to clean up toxic assets, Federal Reserve Chairman Ben S. Bernanke said the recession may end this year and U.K. bank Barclays Plc reported a “strong” start to 2009. Crude oil for April delivery fell 40 cents, or 0.8 percent, to $46.95 a barrel at 10:24 a.m. Sydney time on the New York Mercantile Exchange. Yesterday, April futures rose $1.10 to $47.35 a barrel, the highest settlement since Jan. 6. Prices have increased 6.2 percent so far this year. The Standard & Poor’s 500 Index slipped 0.4 percent to 753.89, erasing a gain of as much as 2.4 percent. The Dow Jones Industrial Average lost 7.01 points, or 0.1 percent, to 7,216.97. The S&P 500 had jumped 12 percent in the previous four sessions on speculation the worst of the credit crisis was over. Finance chiefs from the Group of 20 nations vowed to work together to help global banks recover from more than $1.2 trillion in credit losses. Bernanke said in an interview broadcast on CBS Corp.’s “60 Minutes” on March 15 that if the government succeeds in stabilizing the financial system, the recession will probably end this year. Crude futures plunged in early trading yesterday after the Organization of Petroleum Exporting Countries deferred another production cut for at least 11 weeks at its weekend meeting. OPEC has reduced daily output targets by 4.2 million barrels since September to prevent a glut and slow the decline in prices. The group is scheduled to meet again on May 28. Saudi Arabia, the world’s biggest oil exporter, is the only member to cut more output than agreed last year, according to a monthly OPEC report released on March 13. Iran and Nigeria have made good on only about half of their promised reductions, the report showed. “We need to adhere and then in May we can look if other measures can be taken,” OPEC President Jose Maria Botelho de Vasconcelos said. Saudi Arabia is willing to keep oil output below its OPEC quota level of about 8 million barrels a day unless consumers want more, Saudi Arabian Oil Minister Ali al-Naimi said yesterday. Crude oil in New York has tumbled from a record $147.27 in July because of the economic contraction in major consuming countries. Futures have rebounded since touching $32.40 on Dec. 19, the lowest since February 2004. The Paris-based International Energy Agency last week cut its 2009 forecast for oil demand for a seventh month. Both the IEA and OPEC see demand slumping more than 1 million barrels a day this year, to about 84.5 million. Brent crude oil for April settlement declined 95 cents, or 2.1 percent, to end yesterday’s session at $43.98 a barrel on London’s ICE Futures Europe exchange. The April contract expired yesterday. The more-active May contract rose 58 cents, or 1.3 percent, to settle at $46.46 a barrel. FCPO 3rd month Jun Futures contract fall RM28 to close at RM1902 as compare to previous trading session with 7696 lots traded in the market. CPO price was traded wild during the trading session mainly due to soybean oil and crude oil electronic trading. Technically, CPO price seems well hold above RM1900 against the selling pressure. A huge rising wedge was seen the CPO hourly price chart with support seen at RM1900 and RM1830 region. Traders were advice be extra cautious in the next coming trading as bearish formation was formed in the hourly chart and pattern was confirm provided support levels were violated. Resistances were seen at RM2050 and RM2100 regions. FKLI March futures contract close marginally 4 point higher to close at 844.5 as compare to previous trading session with total 5888 lots traded in the market. It’s a wild trading session for FKLI trading due to mix world regional indices. 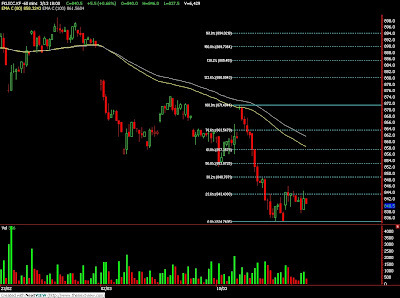 Technically, FKLI manage to break 835 for awhile at 833.5 levels. We have reason to believe that based on wave count, it’s possible that FKLI would complete at 161.8% Fibonacci projection at 833.5 levels. However, traders were still advice to hold short position in the coming trading session while be cautious around resistance levels at 874 and 858 region. Supports were seen at 830 and 803 region. JAKARTA (Reuters) - Indonesia needs to squeeze far higher yields from existing palm oil plantations rather than open up more land in a country with some of the world's swiftest deforestation, a Greenpeace official said on Monday. Indonesia, the world's top palm oil producer, yields only about 2 tonnes per hectare from its plantations, or just a third of the 6 to 7 tonnes in countries such as Malaysia with better estate management practices, said Annette Cotter, campaign manager for the forests campaign in Greenpeace Southeast Asia. "What's interesting about palm oil in Indonesia is that the current plantations actually yield a very, very poor return," Cotter said, speaking as part of the Reuters Food and Agriculture Summit. Indonesia has 7.1 million hectares, or 17.5 million acres of palm oil estates, with smallholders accounting for about 35 percent, but is looking to expand further. In a controversial move, Indonesia's agriculture ministry said last month it would allow 8 percent of its 25 million hectares of peatlands, which harbor huge carbon stocks, to be used for palm oil, ending a freeze on permits dating from December 2007. "You don't need to expand into further forest and further peatland to get increased economic benefits from palm oil," said Cotter, calling the move to end the freeze on peatlands "a total disaster." Up to 84 percent of Indonesia's carbon emissions come from deforestation, forest fires and peatland degradation, a report sponsored by the World Bank and Britain's Department for International Development says. "So what you've got is a situation of relatively poor management of existing plantations and you've got companies looking for further expansion to increase production but not looking at increasing productivity in existing estates," said Cotter, who has spent 12 years at Greenpeace with time in Brazil monitoring Amazon forests. By boosting existing estates' productivity, Indonesia would "go a very long way to increasing production and increasing therefore Indonesia's exports," she added. Under fire from green groups and consumers, the palm oil industry set up a Round Table on Sustainable Palm Oil (RSPO) in 2004, to develop an ethical certification system, with commitment to save rainforests and wildlife. One of Indonesia's top palm companies, PT Musim Mas, was its first to be certified by RSPO in January. Cotter called RSPO a "toothless tiger" that has failed to seriously curb deforestation. "They (RSPO) need to prove that they are actually committed to their principles before we can say they are actually doing a good job," she added. The global financial crisis was delaying planned palm oil expansion and showing up its flaws, she added. "What palm oil is being sold as is the green gold, but it's another classic boom and bust industry," said Cotter, noting that a collapse in palm oil prices late last year led to job losses and fruit rotting on trees. The growing trend of palm oil use in biofuel also threatened conservation and food security, Cotter said. Indonesia and Malaysia, the world's top two palm oil producers, have made the use of palm-based biodiesel mandatory from this year. Cotter said biofuel could be looked at for development only after food security issues had been addressed, and principles of sustainable agriculture enforced. "But that's not the case we are in at the moment." Sharp drops in global food prices, including palm oil, have temporarily eased concerns over food security. "If you look where the trends are going internationally with palm oil it's focusing more and more on biofuels and less and less on food," she said. "And so you're actually going to see in the future questions around food security." March 16 (Bloomberg) -- The yen fell for a third day against the dollar and the euro on speculation a Bank of Japan plan to buy government debt will spur investors to seek higher- yielding assets overseas. Japan’s currency extended this month’s decline before the central bank starts a two-day meeting tomorrow at which it may announce plans to repurchase government securities to keep yields low. The euro weakened against nine of the 16 major currencies on speculation the reluctance of European nations to boost spending will extend the region’s recession and add pressure for lower interest rates. “The yen is likely to be under weakening pressure amid speculation longer-dated yields will decline,” widening the gap between returns on Japanese government securities and those of other states and reducing the currency’s appeal, said Hideki Hayashi, an economist at Shinko Securities Co. in Tokyo. The yen weakened to 98.11 versus the dollar as of 7:40 a.m. in London from 97.95 late in New York last week. It reached 99.68 on March 5, the lowest level since Nov. 5. Japan’s currency declined to 127.02 per euro from 126.65. The European currency traded at $1.2946 from $1.2928. South Korea’s won strengthened 3.6 percent to 1,435.40 against the dollar, and climbed 3.4 percent to 14.6354 versus the yen. The British pound climbed to $1.4078 from $1.4002 late last week. Treasuries due in 10 years yielded 1.60 percentage points more than similar dated Japanese debt, near the 1.73 percentage points reached on Feb. 27, which was the widest since November, according to data compiled by Bloomberg. The spread between 10- year Australian and Japanese debt widened to 2.98 percentage points today. The euro was little changed after four days of gains versus the greenback after German Chancellor Angela Merkel and other European officials said they had spent enough money to combat the financial crisis and don’t want to blow out their budgets. Merkel, speaking as the Group of 20 finance ministers met in the U.K. on the weekend, defended her government’s decision to hold off new economic stimulus spending, saying current investments should first be given a chance to work. Germany has already committed 4.7 percent of its gross domestic product toward stanching the economic downturn for this year and next, the German Chancellor said. Demand for the euro may wane on speculation the European Central Bank will cut rates further to combat the region’s recession. Investors increased bets the European Central Bank will reduce interest rates at its next meeting on April 2. The yield on the three-month Euribor interest-rate futures due June fell to 1.465 percent, from 1.58 percent a month ago, according to data compiled by Bloomberg. The euro may fall to $1.2730 this week, said Commerzbank AG, German’s second-largest lender, citing technical charts traders use to predict price movements. “The euro was overbought last week and stepped closer to the upper limit of the Bollinger band on the back of speculation that stock gains would improve risk appetite, which is why the single currency is weakening today,” said Ryohei Muramatsu, manager of Group Treasury Asia at Commerzbank in Tokyo. The euro strengthened to $1.2958 on March 13, crossing above the upper Bollinger band resistance level of $1.2952 on the euro’s daily chart, Muramatsu said. Bollinger bands are two standard deviations above and below the average price of a currency or a security over the past 20 days. Asian currencies were led higher by the won as regional shares rallied. The Korean currency extended its biggest weekly gain in three months on speculation the U.S. will boost the supply of dollars to emerging markets to ease the global financial crisis. The MSCI Asia Pacific Index for regional shares advanced 1.8 percent today. Foreign governments and private investors are both pouring money into dollars for the first time since 2001, signaling that the U.S. currency is peaking, according to Barclays Capital Inc. The Dollar Index, which the ICE uses to track the U.S. currency’s performance against the euro, yen, pound, Canadian dollar, Swiss franc and Swedish krona, was 87.220 today, from 87.358 last week and 81.308 at the end of last year. Steven Englander, chief U.S. currency strategist at Barclays, estimates foreign purchases of American assets have reached record levels, after they bought $133 billion a month on average since November, based on government statistics. Fed Chairman Ben S. Bernanke and his colleagues start a two-day policy meeting tomorrow. The central bank will keep borrowing costs unchanged at 0.25 percent, according to the median estimate of economists surveyed by Bloomberg. March 16 (Bloomberg) -- OPEC agreed to maintain current production quotas, concerned that a fourth cut since September risked increasing energy costs during the worst global economy in six decades. The Organization of Petroleum Exporting Countries, supplier of about 40 percent of the world’s crude oil, will aim to complete existing production cutbacks agreed to late last year and meet again on May 28 to review policy, Secretary-General Abdalla el-Badri said after yesterday’s meeting in Vienna. OPEC members still need to trim about 800,000 barrels a day to comply with the record output reductions decided in December after oil slumped more than $100 a barrel from July’s record. Global inventories have started to fall, indicating the policy is working. A new cut threatened a price increase that could harm the economy, Saudi Arabian Oil Minister Ali al-Naimi said. The collapse in oil prices has cut costs for consumers and business, one of the few bright spots in a bleak economic picture. Finance chiefs from the 20 biggest developed and emerging economies pledged a “sustained effort” to end the recession after a weekend meeting. The International Monetary Fund predicts the first global economic contraction in six decades. Higher prices could further erode global oil demand, already forecast to fall by 1 million barrels a day in 2009. Oil futures fell after the OPEC meeting, dropping as much as $2.40 a barrel, or 5.2 percent, to $43.85 a barrel in New York. Prior to OPEC’s decision, oil prices had gained 3.7 percent this year. Algerian Oil Minister Chakib Khelil, who had argued for another cutback prior to the meeting, said afterwards that all OPEC members will make an “extra effort” to comply with the existing cutbacks. Oil prices will not rise a lot after yesterday’s decision, he added. The crude oil production target for 11 OPEC members bound by quotas is 24.85 million barrels a day, while actual output from those countries averaged 25.715 million barrels a day in February, according to an OPEC report published on March 13 that cited data from secondary sources including analysts. That means the group had completed 79 percent of its promised reduction. “Now it is time to fully adhere to the cuts we agreed upon,” Qatari Oil Minister Abdullah Bin Hamad Al-Attiyah said after the meeting. Saudi Arabia, which pumps more than twice as much oil as Iran, OPEC’s second-largest producer, is the only member to cut more output than agreed last year. Iran and Nigeria have made good on only about half of their promised reductions, according to figures OPEC released March 13. The group agreed to three cutbacks late last year totaling 4.2 million barrels a day. The 12-nation producer group doesn’t expect a rapid recovery in prices to $75 a barrel, the level that several ministers and Saudi King Abdullah have previously said is appropriate to encourage investment in the industry. OPEC’s el-Badri criticized Russia and other non-OPEC producers for failing to restrict their own output to support oil prices. The group already faces a 61 percent plunge in net oil revenue this year amid declining production and prices, according to the U.S. Energy Department, which estimates OPEC will earn $383 billion in 2009 from crude exports. Global oil demand is set to decline for a second consecutive year, the first back-to-back drop since 1983. The Paris-based International Energy Agency last week cut its 2009 forecast for oil demand for a seventh month, and reduced supply estimates, as the global economic slump saps consumption as well as investment in new fields. Both the IEA and OPEC see demand slumping more than 1 million barrels a day this year, to about 84.5 million barrels a day. OPEC’s May 28 meeting and an already scheduled Sept. 9 summit will both take place in Vienna, where the group’s secretariat is based. El-Badri’s term of office was extended for another three years from 2010. March 16 (Bloomberg) -- Crude oil slumped as much as 5 percent in New York after the Organization of Petroleum Exporting Countries decided against deeper output cuts that may have damaged the global economy. OPEC yesterday deferred another reduction for at least 11 weeks while member states complete cuts agreed in December. Nigeria has returned to normal contract terms for exports from the Bonny and Forcados fields, Mohammed Barkindo, head of the state-owned national petroleum company said yesterday, restoring supplies from Africa’s largest producer. Crude oil for April delivery fell as much as $2.40, or 5.2 percent, to $43.85 a barrel in after-hours electronic trading on the New York Mercantile Exchange. It was at $44.43 at 7:40 a.m. Singapore time. The contract fell 1.7 percent to $46.25 on March 13 after OPEC and the International Energy Agency each lowered their demand forecasts for 2009, citing the global recession. OPEC pumps 40 percent of the world’s oil and has reduced daily output targets by 4.2 million barrels since September to prevent a glut and slow the decline in prices. The 11 member- states subject to quotas are still producing about 800,000 barrels a day more than the group agreed in December. “We need to adhere and then in May we can look if other measures can be taken,” OPEC President Jose Maria Botelho de Vasconcelos said yesterday. Brent crude oil for April settlement fell $1.43, or 3.2 percent, to $43.50 a barrel on London’s ICE Futures Europe exchange. The contract, which expires at the close of trading today, fell 16 cents, or 0.4 percent, to $44.93 on March 13. The more actively traded May contract fell 3.6 percent to $44.21 a barrel after falling 0.7 percent on March 13. At the start of March, 31 of 41 analysts surveyed by Bloomberg News were expecting OPEC to cut output by as much as 1.5 million barrels. That consensus diminished last week as some OPEC ministers urged greater compliance from fellow producers before setting further reductions. Hedge-fund managers and other large speculators last week increased their bets on falling oil prices for a second week, according to U.S. Commodity Futures Trading Commission data. Speculative net-short positions, the difference between contracts to buy and sell the commodity, jumped 11-fold to 6,015 contracts on March 10, the commission said March 13. New York futures have fallen 70 percent from their $147.27 record on July 11 as slowing world growth forced the International Energy Agency to revise its demand outlook for seven straight months. Oil reached a four-year low of $32.40 on Dec. 19. Finance ministers from the 20 largest economies yesterday pledged a “sustained effort” to cleanse banks of bad assets and free up global lending. A report today in the U.S., the world’s largest oil consumer, will probably show industrial production fell 1.3 percent in February, the sixth decline in seven months, according to a Bloomberg News survey of economists. Macro-economic reports aren’t likely to provide support for oil any time soon and yesterday’s OPEC decision will probably leave prices to “range-trade” between $40 and $50, Commodity Warrants’ Hassall said. U.S. crude oil inventories in the U.S. stalled at about 351 million barrels the past five weeks, after climbing 9 percent in January. March 13 (Bloomberg) -- The International Energy Agency and OPEC cut their 2009 forecasts for oil demand for a seventh month and reduced supply estimates as the global economic slump saps consumption as well as investment in new fields. Both organizations see demand slumping by more than 1 million barrels a day this year. The Paris-based IEA, adviser to 28 nations, reduced its forecast to 84.4 million barrels a day, a decline of 1.25 million barrels from 2008. OPEC’s estimate dropped to 84.6 million barrels, down 1.01 million barrels. “The demand collapse has been staggering, based on the whirlwind nature of the slump in the global economy,” the IEA said in its monthly oil report today. The Organization of Petroleum Exporting Countries, which also released its monthly market analysis today, said the “dreadful” economic situation is causing the slide. The two groups usually produce their reports on different days. OPEC will meet in Vienna on March 15 to review production quotas as oil trades nearly $100 a barrel lower than a record high of $147.27 a barrel in July. The front-month March crude futures contract traded at $47.48 a barrel on the New York Mercantile Exchange at 2:45 p.m. London time. Members are still implementing cuts agreed last year totaling 4.2 million barrels a day. Efforts to increase prices by cutting more production pose a risk to economic recovery, the IEA’s executive director Nobuo Tanaka said last month. OPEC rejected the IEA’s argument that cheap oil will rejuvenate the world economy. Instead, lower prices may lead to a supply crunch by 2013, the group’s secretary general, Abdalla el-Badri, said last week. Algeria has said OPEC should agree to new curbs in Vienna, while members such as Qatar and Nigeria said there is no need for further action. The revision in the IEA demand forecast was driven by declines in North America, Asia and the former Soviet Union. OPEC said consumption is also slowing in developing countries, which had previously compensated for declines elsewhere. Both groups said declining demand would be partially offset by a drop in supply growth from outside the group, as well as OPEC quota cuts. The IEA trimmed its forecast for supplies from outside OPEC this year to 50.6 million barrels a day. A lack of available credit to fund investment in new projects and production problems in Azerbaijan mean non-OPEC supply will be unchanged this year, it said. OPEC cut its forecast for oil supply from outside the group to 50.7 million barrels a day. That still leaves an increase of 370,000 barrels a day this year over 2008. The two organizations also agreed on the degree to which OPEC has implemented previous production cuts. The 11 OPEC nations bound by production quotas pumped 25.7 million barrels a day last month, the IEA said, compared with their official Jan. 1 limit of 24.845 million a day. That implies the group is complying with 80 percent of its production targets. OPEC estimates February production by its 11 members excluding Iraq at 25.715 million barrels a day, or 870,000 barrels a day more than its target. That implies compliance of about 79 percent. If the producer group complies completely with its production cuts, it will be pumping 1.6 million barrels a day below demand for its oil, leading to a potential drop in stockpiles, the IEA said. March 13 (Bloomberg) -- Crude oil fell after the International Energy Agency and OPEC cut their global demand forecasts because of the recession in major consuming countries. “When both the IEA and OPEC are calling for a substantial drop in demand, there is going to be pressure on oil prices,” said Michael Lynch, president of Strategic Energy & Economic Research, in Winchester, Massachusetts. Crude oil for April delivery fell 78 cents, or 1.7 percent, to settle at $46.25 a barrel at 3:02 p.m. on the New York Mercantile Exchange. Prices have gained 1.6 percent this week and are 3.7 percent higher so far this year. The Organization of Petroleum Exporting Countries lowered its estimate for 2009 global demand by 520,000 barrels to 84.6 million barrels a day in this month’s report. Consumption will now drop by 1.01 million barrels a day this year, according to the report. OPEC ministers will meet on March 15 in Vienna to discuss making a production cut. The group has reduced daily output targets by 4.2 million barrels since September. Members will “probably” opt for a combination of a production cut and greater compliance with previously announced reductions, Venezuelan Oil and Energy Minister Rafael Ramirez said today in an interview. Kuwaiti Oil Minister Sheikh Ahmed al-Abdullah al-Sabah said “all options are on the table” at the meeting. Nigeria is opposed to further reductions by OPEC countries at the meeting, a spokesman for the state oil company said yesterday. Qatari Oil Minister Abdullah bin Hamad al-Attiyah said this week that the group needs to reach full compliance before taking any new action. The 11 OPEC nations bound by production quotas, all except Iraq, pumped 25.7 million barrels a day last month, today’s IEA report showed. That compares with OPEC’s Jan. 1 limit of 24.845 million barrels a day. The figure implies the group is complying with 80 percent of its production targets, the IEA said. Oil inventories are “above average” and Venezuela is seeking a price floor of $70 a barrel, Ramirez said. Brent crude oil for April settlement fell 16 cents, or 0.4 percent, to $44.93 a barrel on London’s ICE Futures Europe exchange. Oil has dropped 69 percent from the record $147.27 a barrel reached on July 11 as the U.S., Europe and Japan face their first simultaneous recessions since the Second World War. Goldman Sachs Group Inc. cut its forecast for the global economy for the second time in eight days after predicting a deeper recession in Europe. Countries using the euro may see a decline of 3.6 percent in 2009, and the world economy may contract by 1 percent, according to London-based Goldman economist Binit Patel. Prices fluctuated between an increase of as much as $1.11 a barrel and a decline of $1.26 today in New York as attention shifted between OPEC statements and the demand projections. Crude oil volume in electronic trading on the Nymex was 391,507 contracts as of 3:10 p.m. in New York. Volume totaled 660,226 contracts yesterday, 21 percent higher than the average over the past three months. Open interest was 1.24 million contracts yesterday. The exchange has a one-business-day delay in reporting open interest and full volume data. FCPO 3rd month May Futures contract rose RM52 to close at RM1972 as compare to previous trading session with 10036 lots traded in the market. CPO price was trading strong during the trading session due to soybean oil and crude oil overnight strong closing. Technically, CPO price seems might encounter great selling pressure around 61.8% Fibonacci retrace figure at RM1980 region. We expect CPO price would trade higher in the coming trading session with support seen at RM1910 and RM1880 regions. Traders were advice to hold long position around support levels while being alert around resistance levels at RM1980 and RM2023 levels. FKLI March futures contract close 5.5 point higher to close at 840.5 as compare to previous trading session with total 6429 lots traded in the market. FKLI was trading sideways during trading session despite previous Dow Jones overnight strong closing. Technically, FKLI manage to rest on 78.6% Fibonacci retracement figure 837.5 after break down from symmetric triangle in the 15 min FKLI price chart. We expect FKLI would rebound in the coming trading session with resistance seen at 853 and 858; 50% and 61.8% Fibonacci retrace levels. 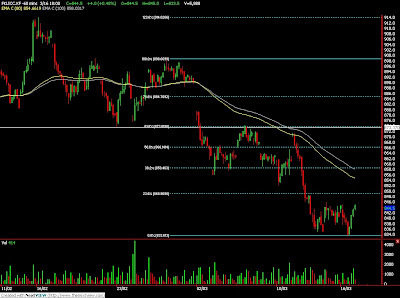 Traders were advice to hold short position around the resistance levels while support levels seen at 835 and 830 region.